Of all the things I could have named this Motorcycle Ride Report to make it seem interesting, I chose this one—not to attract perspective readers, but rather to deter them. For those who found Pirsig's autobiography to be a nothing more than the grossly overrated ramblings of a mental patient, I can assure you this one will prove far worse. For those who might enjoy the rants and views of a lonely introvert pondering the merits of a social life, or at least for those those of you wonder why you are mentioned in here, read on. The ride started at 8:30am, immediately following a graveyard shift at my work. I can’t remember when I actually got up the day before, but I wasn’t feeling too tired, so I decided to go ahead for a short ride. This story, however, starts long before that. Some general dissatisfaction with the friends I've made has been building up for years, reaching a high point last year with a close friend named Megan. I valued our friendship a lot, but sometimes found myself getting frustrated that she wasn't very good at returning my telephone calls. With her, though, I knew it wasn't personal—it wasn't that she didn't like me, she just wasn't very good at maintaining friends, or going through the effort of answering a ringing phone or displaying any sense of caring. (Yes, she had some mental issues she struggled to keep under control so I was more forgiving with her than I would be with most people.) So I continued to call and leave a message even though I didn't expect a response, sometimes a few times a month, sometimes several times a week, just to let her know I was still cared about her. And then, once twelve months had passed without her answering or returning a single call, it occurred to me that I'd fulfilled my share of the friendship. And so in an event that some people found incredibly inappropriate, but I found hilarious, I decided to end the friendship. Suffice to say that it did finally result in her responding, even if only by e-mail.Perhaps it was slightly cruel to end it that way. I really should have given up on her long before, and I vowed to myself not to let that happen again. And yet as I begin this ride, I find myself in almost exactly the same position with another friend. I leave my work aboard my 2005 Kawasaki Ninja 250 with one only purpose: to claim and place a “photo tag” in an online game on ADVrider.com. The rules are simple: figure out the location of a toy cat based on some photos and clues given, get it, and put it on another dirt road somewhere else for the next player to repeat. The current tag is about half an hour southeast, close to Waynesboro. I've put the location into my GPS, and after taking the Interstate to get out of Harrisonburg, I switch to the more enjoyable backroads. I'd recently put new high performance air filters and an exhaust on my motorcycle and adjusted the carburetors, and the ride gave a good opportunity to test that the bike was fueling correctly at all RPM and throttle positions. While I was very satisfied with the bike's performance, I was a little irritated at the noise from the exhaust, which changed from a pleasant low, deep grumble at idle and slow speeds to something more associated with inducing migraines as I approached highways speeds. I found the tag location easily enough, and then rode around another 45 minutes or so until finding a new location that would suit nicely for a tag spot. I snapped a few pictures with my phone, when a thought occurred to me. Another member of the game, Randy, lived quite close to my current location, and we'd agreed to swap some motorcycle parts from our bikes when we had a chance. I called him up to see if he wanted to do that then, but he didn't answer. No matter—there was no hurry. I decided to keep riding around a bit, eventually stopping at a gas station where I filled up the bike and grabbed some snacks to eat and a drink to keep hydrated in the 90*F+ weather. I've done 161 miles on this tank, which was last filled when I changed the exhaust and air filters, so the 3.5 gallons I put in means I'm now getting 46 miles per gallon. Down a bit from the 50mpg I'm used to getting—which is to be expected from the changes. What bothers me though is that I really should be getting 60mpg, and my bike should have been getting even better than that before the mods. I know my last Ninja250 had no problems getting 65mpg with the same modifications and riding style. While enjoying the snack and uploading the tag pictures from my phone, three other motorcyclists entered the shop, and we ended up chatting a bit. The two men and the woman, about a Ducati Monster, Speed Tripple, and ZX-12R, had ridden down that morning from Ontario. They either had little understanding of the USA's speed limits, or had an entirely different opinion of “morning” than I did. We chatted for a while about motorcycle insurance rates and health care. Then we talked about our jobs and where we lived, and I mentioned I was from Europe originally, and that my parents had moved back there a few years ago. In the hot sun, the topic then moved to what protective gear we wore. One of them made a comment that they primarily wore all their gear because he would never want to put his family through the stress of him being injured or killed. The other guy then pointed to me and said “Yeah, but this guy's parents don't care about him. They moved away from him back to Europe!”. I laughed at his rather strange sense of humor while the other two riders gasped at his inappropriateness. He just laughed, reminding them that we'd never meet again. Before we went our separate ways, they did leave me with one valuable piece of information: The $10 toll to ride on the Skyline Drive was waived today, and anyone could go on it for free. 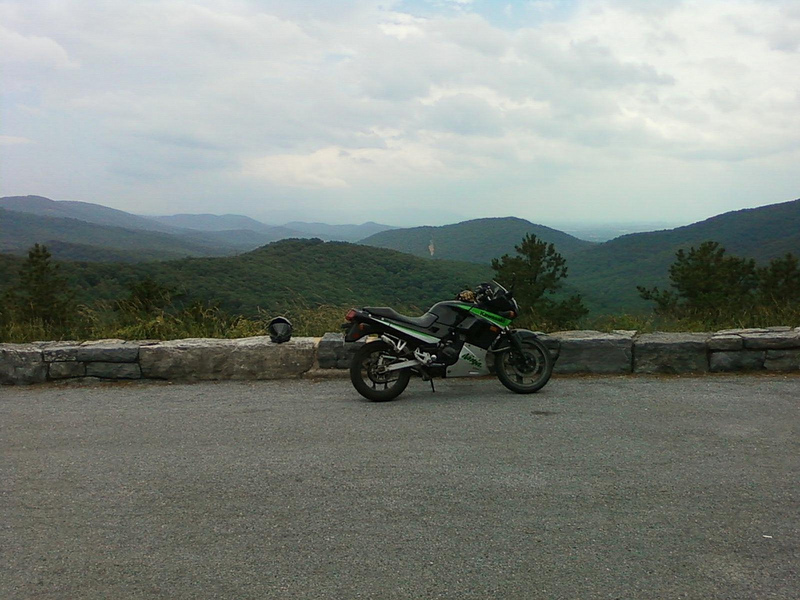 I've lived here for eight years now, and have been riding for four, and yet I have never been on the Skyline Drive. It's a road that follows the ridge of the blue ridge mountains, maintaining elevations between 2,000 and 3,000 feet. It's nothing but constant curves, and is supposed to be very scenic. How I've never been on it, I don't know. But today seems like the day to do it. The entrance at Afton mountain isn't far away. But first...I've got a craving for a milkshake. Yeah...I get these milkshake cravings a lot. I love milkshakes. I ride around the country roads with no real destination until I finally come to a Dairy Queen where I enjoy a wonderful Banana and Raspberry milkshake. This Dairy Queen is only about 4 or 5 blocks from where Randy lives, so I give him another call to see if he's around. Again, no answer, so I guess he's not home anyway. At that point, an interesting thought occurs to me. Just a few years ago, before this super high-tech society emerged where everyone receives high-speed Internet on a phone the size of a matchbox, you could call someone's house, and if they answered, you'd know they were home. That's all changed now. No one dares leave the house without their cell phone anymore. The only time people don't answer their phones anymore is when they're home, because then they can't remember where they put it. So if someone doesn't answer their phone, it probably means they are home. Five minutes later, I'm knocking on Randy's door. Not that I want the motorcycle parts, but it just seems rude to go right by someone's house and not stop to say hello, especially when I've determined (by my logic, at least) that he is home. As it turns out, I was wrong. No one was home, though there were some dogs who seemed either very happy or very unhappy to see me as I arrived. Those are pretty much the two reactions you'll get when you arrive unannounced at someone's house, dog or human, but it's hard to tell the difference with dogs, and I didn't really feel the need to stick my hand through the fence to determine which one it was. I have another friend who lives in Crozet. Brandy, the friend whom I’ve not seen since the beginning of February, who hasn’t been returning any of my phone calls lately. She’s not as bad as Megan, though, because about once every two months she will answer her phone or even call me. Then she’ll assure me that she really does want to remain friends and wants to see me again. And then I won’t here from her for another two months. So I call her, and, no huge surprise, she doesn’t answer. Unfortunately, I don’t know exactly where she lives…but I do know where she works: in Charlottesville, about 45 minutes away. When you’re riding, any excuse to ride more is a good one, so I head out in a vaguely Eastern direction, turning off my GPS and exploring where new roads take me. After about an hour and a half, I arrive what I figure must be the store at which she works (She’d mentioned it’s a CVS on route 29, and I don’t know of any others.) I will mention at this point that showing up at her work unannounced was actually her idea…she’d said my best bet for hanging out with her was to show up at her work when she was leaving and kidnap her. I see her immediately when I enter, but wait for her to finish dealing with customers before approaching. After the usual explanations about her being too busy at work to return calls, I ask her what time she gets off work. 3:30, she says, though she says she often ends up working a little later. Perfect. I’ve got no plans for the rest of today. Well, I suppose at some point I need to sleep, since I’ve already been awake for quite a while, but I can certainly postpone that to spend an evening with her. She agrees to call me at 3:30 and let me know when she’s getting off work. Great…then I make her promise that she really will call me. I’ve actually got some exciting news to tell her. Well, exciting for me, at least—I’m not sure how much she would care. The last several months, I’ve been writing a very long story in rhyming verse, loosely based on her and another girl from class. I’ve almost finished the story—in fact, I’m on the very last page. The last time I showed it to her, I was only on chapter 4, so I can’t wait to see what she thinks of the rest of it. Come to think of it, the other girl from the story—Jessie—also hasn’t returned my calls in a while. I’ve got a few hours to kill before 3:30, so I give her a call. No answer, of course. I’ve never been to Jessie’s house before, but we did once make plans to meet there, so I’ve got it programmed into my GPS. It’s about half an hour North—but I head south, instead, back towards Afton Mountain. There, for the first time in my life, I get on Skyline Drive. The attendant who would normally collect the tolls confirms that today is free. I consider asking why he needs to work as a tollbooth operator when there’s no toll, but instead, I just drive north. I’ve heard so much about Skyline Drive, I’m quite excited to finally get to ride it. From what I’ve heard, it offers beautiful views along the scenic mountains, hundreds of twists and turns, and more cops patrolling the ridiculous 35mph speed limit than any other stretch of road on the country. Well, that kind of takes the fun out of all the turns, but there are other roads and tracks for that. I’m not in a big hurry, so I stick to the speed limit and enjoy the scenery. All to my right, there are lots of trees. To my left…more trees. This isn’t quite the scenery I’d imagined. About every mile, there is a pull-off where you can get a great view of the valley, though. I stop at some of these. The first one did indeed have a great view of more mountains. And so did the next one—pretty much the same exact view, in fact. Had I taken photographs from each of these stops, I’m sure I would never have been able to tell any of them apart, so I just kept riding. After all, there was as much variation between the trees on either side of me as there was between the views at the pull offs. More interesting to me at this point was the view above, as the skies were becoming quite dark and the thunderstorm predicted for the afternoon was clearly on way. One nice thing about Skyline, though: maintaining a steady 35mph in 6th gear kept the exhaust note the quite, pleasant rumble. Probably good for my gas mileage, too. Once arriving at the intersection of 33 at the top of Lydia Mountain, I enjoy ripping through the switchbacks of route 33 as fast as I can—a welcome change from the tedious pace I’d maintained the last 40 miles. Once arriving in Ruckersville, I switched my GPS back on and let it guide me to Jessie’s address. I pulled onto her road, ignoring the numerous signs saying “Private road,” “no entrance without permit,” and “all unauthorized vehicles will be reported to Sheriff’s Office”. I mean, people who live on this road must occasionally have visitors, right? I keep my exhaust as quiet as possible just in case, though. As I pull up to the house, a dog in the yard starts barking relentlessly. When I knock at the glass door, another dog jumps and lunges at me from inside, throwing himself into the glass. Jessie’s father came to the door and recognized me. “You must me looking for Jessie,” he says. I explain I was just out riding and thought I’d stop by to say hello. He responded that Jessie wasn’t at home—actually, they didn’t know where she was, and she didn’t live there anymore. That was rather disappointing, but I did end up talking to her father for quite a while, discussing Jessie, the school she went to (where I also had gone), and talking a lot about dogs. As the skies became even more threatening, though, I thought it best to leave and head back east to meet up with Brandy. I managed to outrun the rain for a while, but did get a bit wet as I arrived in Charlottesville. When went back into a bit after 3:30 the CVS, I didn’t see Brandy right away, but she hadn’t called so I assumed she was still at work. I asked one of the other employees if she was still there. The response: “No, she left at 3:00 today and went home”. I can’t say I was surprised. I really didn’t expect anything else from her. In fact, this is what I’ve come to expect from most of my friends. I remember in college, I had three dates with a girl I really liked. Once we decided to meet at my house. Another time we arranged to meet at the movie theater. I can’t remember what the third one was, but she never showed up to any of the three. When I’d see her later, she’d never really talk about it. If I brought up the fact that I’d waited for her all night, she’d apologize, but never seemed to feel that she’d done anything wrong. I’ve since learned to give up on girls I have an interest in dating much sooner, but I’ve also learned not to expect anything different from my friends. So the real question now was what I should do with my free time in Charlottesville. I knew what I wanted to do: get a book back from another friend, Elizabeth, who lives here. This is someone who is completely different from all my other friends. She’s professional, punctual, and seems to be quite successful, with a good job, a steady lover, and a dog. I have a huge amount of respect for her. She is, in fact, the complete opposite of many of my other friends. But I can’t get my book back from her today. I don’t have her phone number. I never did. She asked me if I wanted her number once, and I thought about it briefly and said no. I couldn’t imagine a situation in which I’d ever call her. This probably sounds pathetic, but I don’t really know how to be friends with someone like that. I don’t know what I could possibly bring to a friendship to enrich her life. And without that, I’d have no reason to call her. Still, though, I’d like my book back eventually. I realize that this sounds like I’m only friends with people who are unsuccessful or need help or something like that. That is not that case at all. My four closest friends are all much more successful than I, have great lives, and are quite reliable. I actually consider them as two pairs of friends: Teddy & Jenny, who are married, and Taylor & Justin, who are engaged. They all live quite far away, though, and have jobs that keep them busy. Teddy & Jenny also have a 9-month baby girl, which makes it difficult to go out and party with them. And Taylor & Justin like to go to bed at 8pm, which makes it even more difficult. Ouch. I’ve got to admit that it stings to find out that people you consider a friend have never even saved your number in their phone. I respond with my name, and immediately receive the inevitable response that she’s busy. While I’m at it, I send a text to Melissa (also known as Knob Girl) to see what she’s doing tonight. No responses from anyone, so I figure it’s a good time to get lunch. Actually, this would probably be a good time to get some sleep, but since there’s a pizza restaurant around the corner and no bed, I opt for pizza and wait for the storm to move away from my intended direction of travel. After a good meal at Rise Pizza, I get back on the bike. I get a text message response from a friend saying he’s out of town, so I fire up the bike and head west. I don’t bother with the GPS—I just take the smallest roads I can find that seem to lead in the general direction back to Harrisonburg. I get some great high-speed riding on some empty, twisty roads, until they become even more desolate, eventually turning to dirt roads. The rain has made them a little muddy, but not too bad. Just as it turns to dirt, I come upon a big 4X4 truck in front of me—first traffic I’ve seen in a while. Not really an issue, as a truck like that can surely go on a dirt road faster than a Kawasaki Ninja. Right? Apparently not. The truck driver maintains a speed between 12 and 15 mph the entire way. Several times he pulls over onto the grass, as if to let me pass, but then quickly swerves back across the road. So he’s not letting me pass---he’s just a terrible driver. Or possibly falling asleep. I stay back and keep my distance. After 5 miles or so, the road turns back to asphalt, with a speed limit of 55mph. The truck accelerates to 25mph, slowing down to 10 for any turns. No way to pass him. Irritating, but I’m in no hurry. Even more irritating is that judging by the setting sun, the road has turned around a bit and I’m not heading due east—away from where I want to be going. Eventually I take a turn to get away from the truck, and find myself on some great fun empty roads around the town of Free Union. After having fun scarring all the deer by the side of the roads there, I make my way north until I reach Route 33, and cross back over the mountain towards Harrisonburg. I stop in Elkton to get gas. I’m curious how my gas mileage will have been affected by the combination of full pin riding and the slow 40-mile stretch along Skyline Drive and 20 miles behind the truck. 194 miles since I filled up by Crozet, and only 2.9 gallons go in. 67mpg---very impressive! Next to me, a V-Rod is also filling up. As he pulls away, any fears I’d had about my exhaust being obnoxious disappeared. I’m not sure I’ve heard an exhaust so loud since watching alcohol funny cars at a drag race. I know I could remove my exhaust completely and no be anywhere near that loud. I check my phone for any responses again, and finding none, decide to ride over to Melissa’s house, if for no other reason than to ask why she’d not responded. At the time, it made perfect sense—but keep in mind I was quite sleep deprived at this point. I don’t know if I would have thought differently had I not been so tired, but I do know that a lack of sleep seems to lower my inhibitions, so I set off without a second thought. I arrived at Melissa’s apartment complex, parked my bike in the visitor’s spot, and walked towards her building. As I approached, three people walked by me, each greeting me as they passed. I returned the greetings, but after the third person, I paused briefly and inquired if I’d ever met any of them before. They said no…but they’d love to meet me! So we exchanged introductions, and I explained I was on my way to see if my friend Melissa was home. They had actually just left her apartment, and informed me she was indeed home with her roommate Oscar, and not busy at all. After the rest of my attempts today, this was a very welcome relief to hear. I hiked up the stairs to her apartment and knocked on the door. I thought I heard someone come to answer it, but I may have been mistaken, as it didn’t open. I rang the doorbell and waited a minute. Then I knocked again, and rang the bell again. This didn’t make sense. The folks I’d met had just come from here…she had to be there. There was no other way out. I pondered this for a few minutes before knocking again. Nothing. I was very confused. Melissa has been the one friend who’s actually been interested in hanging out with me recently. I’d seen her just 3 days ago, and we’d had a good time—at least I’d thought we had. I can only imagine she was either taking a shower or an enormous crap and couldn’t answer the door. Hopefully the former, as she whatever she was doing she apparently was doing with her roommate, since he didn’t answer the door either. As I walked away, I called her phone, but of course no one answered. So I sent a text to Mike, asking where he was at that moment, mostly just curious if I could get any sort of friendly response from anyone today. No response. At least I had a new destination. I crossed over to the other side of town, and pulled into Mike’s driveway just as he stood outside, and waved to me. It was the first time all day that anyone had seemed happy to see me. I dismounted, and we began talking. Feeling exhausted, as well as somewhat emotionally drained from my friends, I sat down on the driveway as we began talking. He’d only just arrived back in town from a long camping trip in west Virginia, and was just finishing washing his bike when I arrived. As I told him about my day, he offered to wash my bike, which I happily accepted. Washing the bike was something I’d neglected to do ever since I bought it in January. As he cleaned it, I told him the story of my 280-mile long ride. When I’d finished, he asked me about my job search, and where I was looking. He then commented that it didn’t really make much sense to stay in Virginia, since it was obvious from today’s ride that no one likes me here. Okay, those weren’t his exact words, but he brought up a valid point nevertheless. After he’d finished cleaning, we lubed my chain, and I headed off, back to work where I hoped to get two hours of sleep before beginning another graveyard shift. I lay down, but wasn’t able to sleep as I kept thinking about my friendships. I see so many similarities between my friends, and few of them are good. Yet these are the friends I keep making. I’m so used to it, I’d be really confused if I had a friend who was reliable. It’s a rare, strange type of person who actually wants to be my friend, and those traits seem to be mutually exclusive with reliability. The one exception seems to be if they also ride a motorcycle. Then they are able to be both my friend and actually act like a friend. But I can live with that. As long as you have riding buddies, who needs friends?